When 2 Girls Who Travel get hungry, the city of Houston is our oyster. Saturday evening, we were a few notches away from starvation. We originally planned to review a new restaurant in West Houston, but after being seated for a few minutes and being told the chef wasn’t there yet to prepare our food, we decided to give them a few more weeks to work out the kinks before we reviewed them! So we happed upon Jerry Built Homegrown Burgers – the Memorial City location – and opted for burgers. Our first try of Jerry Built was about a month ago with our Houston Food Blogger Collective fam at the West University location. We just never got around to reviewing them … so here it is! 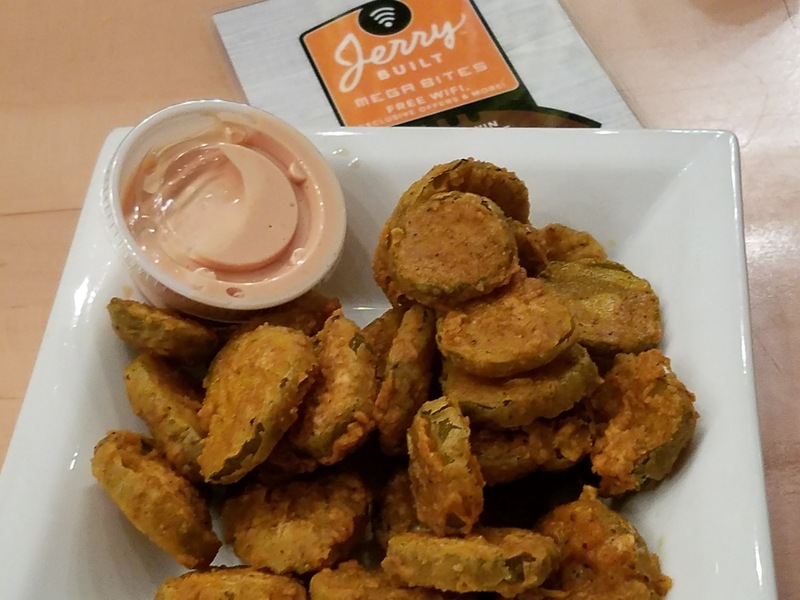 Fried pickles are one of 2 Girls Who Travel favorite appetizer to order at any restaurant. These were pretty good. Jerry Built Homegrown Burgers truly has a family atmosphere, so feel free to bring your kids! And they also offer some adult beverages – there’s nothing wrong with burgers and wine! Restrooms were clean and the dining area is spacious. They have a nice variety of items on their menu – particularly the sides – to be a burger joint. Of course you can get burgers, but they offer made-to-order salads, chicken strips and even hot dogs. They even have some seasonal items, which we got to sample with the food bloggers. 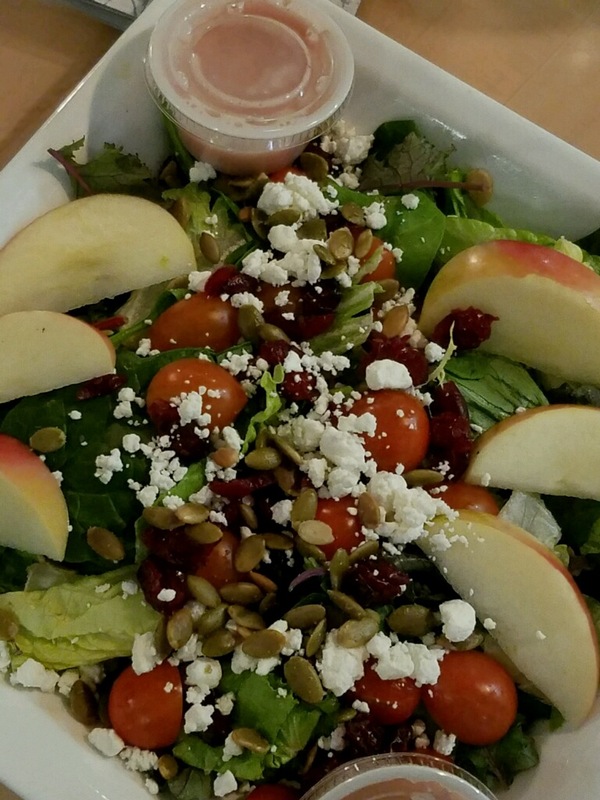 One of the restaurant’s seasonal items: Divine Harvest Salad. This salad was massive and full of good stuff like dried cranberries, goat cheese and pumpkin seeds! 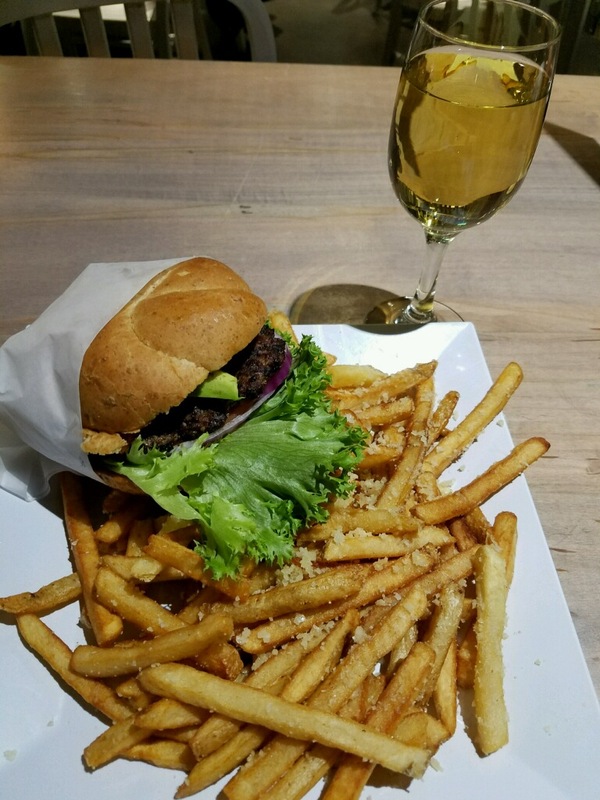 Kim’s pick: Bacon Avocado Burger, truffle parmesan fries and wine. This meal was very good and big enough to leave me feeling stuffed and my palate satisfied. 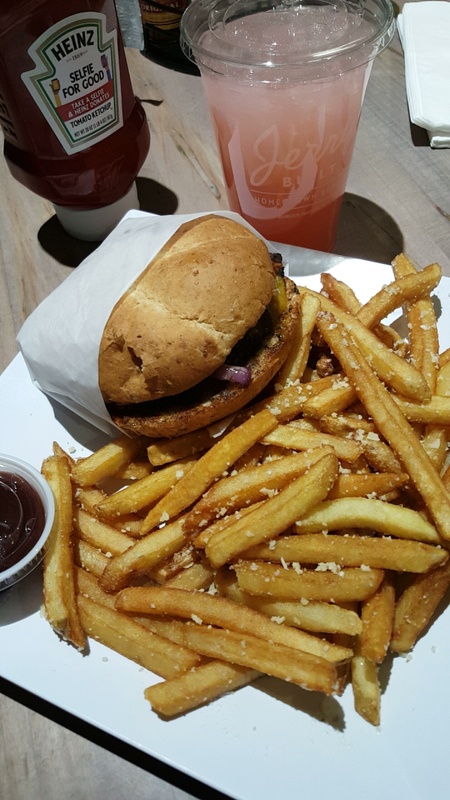 Val’s pick: Ernie’s Bacon BBQ Cheddar, truffle parmesan fries and strawberry lemonade. This burger was full of goodness and I appreciate the little things like plenty of BBQ sauce. And the fresh-squeezed strawberry lemonade was the perfect blend of tart and sweet. Jerry Built Homegrown Burgers has three different Houston area locations. Each prides itself in its community involvement. After speaking to the owner of the West University location, we could really tell it’s true. When they first opened, he gave coupons to residents entitling them to a free meal – no purchase required. After he got them in the door, he was able to build relationships with families and he began to see them become return customers. Jerry Built Homegrown Burgers gets two thumbs up from 2 Girls Who Travel. Check their website for more information. We LOVE this Place!!!! So Yummy!!! My mouth is watering! Friend pickles (and homemade milkshakes) are my biggest weakness.